Zoomed in a bit further, you can see that there are loads of little droids on the banner. 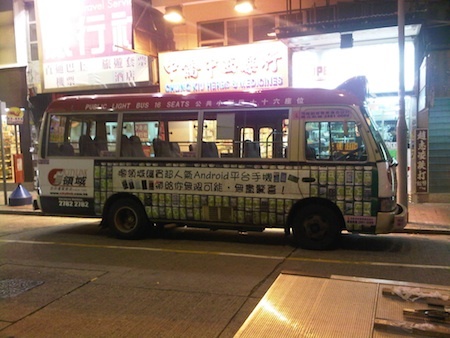 Though, I don’t quite understand what the app is talking about (my Cantonese / Chinese reading is nearly not existing) I reckon that ad is there to just advertise for Android. With a smartphone penetration of 58% (if I remember correctly), every second mobile in Hong Kong is a smartphone. While the iPhone is still the main smartphone used for personal and the BlackBerry for business life, Android phones are getting more and more popular – like everywhere in the world. Most of those new Android phones are built in Asia anyway and therefore, they hit Hong Kong very early after being released publicly. ← 71% of all Android Users want to keep their Robot! Wow that’s a lot models! Are they all diffrent? Strange to me that android is in english in hk. I love android Phones because of its amazing applications!! The advertisement is telling that you can buy latest Android phone from a shop called ‘Link’. And you will be surprised with the infinite possibility it brings.